Darjeeling: Superstar Rajinikanth is scheduled to arrive in the Darjeeling hills on Wednesday and spend the next 40 days for the yet to be titled film directed by Karthik Subbaraj. "On June 6, superstar Rajinikanth will reach Kurseong and he will be there for shooting for the next 12 days. The shooting will take place at various spots in Kurseong, including the area near Ranger's College," said a member of the line production of the film. The actor plans to devote 36 days to the movie in the hills but four extra days have been kept to tie up any loose ends. "After Kurseong, he will come to Darjeeling and the shooting will take place at various spots like St Paul's School, Mount Hermon and the surrounding areas. Never before had a star stayed in the hills for so long for shooting," said the production team member who has handled a number of Bollywood crews in the hills. From Shah Rukh Khan to Priyanka Chopra and Ranbir Kapoor, all had visited Darjeeling for shooting. But they didn't stay in Darjeeling or so long. In fact, this is the first time that Rajinikanth will be in Darjeeling for shooting. "More than 700 support staff are coming to the hills for the shoot," said the crew member. The hills have attracted Bollywood on a regular basis and most of the films, right from Rajesh Khanna-Sharmila Tagore starrer Aradhana to Shah Rukh Khan starrer Main Hoon Na, were box-office hits. The south Indian film industry discovered Darjeeling not much earlier. In April last year, Telugu actor Ravi Teja was in Darjeeling to shoot for Raja-The Great. The film was produced by Dil Raju and directed by Anil Ravipudi and had Mehreen Pirzada cast opposite Teja. The first Telugu film to be shot in Darjeeling was a box office success. Darjeeling is set for another box office hit because the "Thalaiva" is finally here. 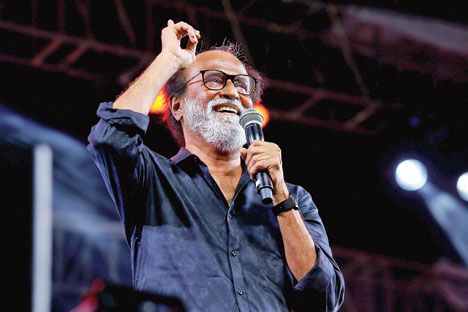 Superstar Rajinikanth is scheduled to arrive in the Darjeeling hills on Wednesday and spend the next 40 days for the yet to be titled film directed by Karthik Subbaraj.